The elevator doors opened, and Evan found himself face to face with the elevator's eight occupants, all staring straight ahead. Nobody moved. Calculating that there was enough room for him to board, Evan stepped forward, slightly jostling the tall woman directly in front of him "Excuse me," he said. 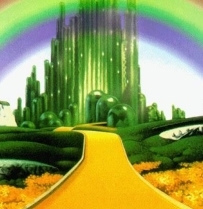 Approaching the Emerald City from the Yellow Brick Road. Photo by Mickey Kirksey. The elevator doors closed behind him, and as the elevator began to move upward, Evan scrunched his shoulders, pulled his elbows tightly into his sides, and carefully rotated himself in place to face the doors. He inevitably brushed against the tall woman again, who responded by shifting about two inches to the southwest, which movement rippled across the other four southwestern occupants of the elevator. Evan had claimed his space. So goes the ritual of elevator boarding. It varies from culture to culture, but that's how it's done in the U.S. It's a fairly unfriendly, mildly competitive, and ironically isolating process. Imagine a similar scene in a parallel universe. The elevator doors open, Evan notices that the elevator is almost full, and says, "Room for one more?" The tall woman responds, "Sure, c'mon aboard." The passengers in the southwest corner of the cab move over to make room and one says, "Yeah, c'mon in. Now we have enough for volleyball!" Life can be so different — so much more fun — and we can make it happen. Here are some of the everyday rituals we can change. One or both will form single file to make space for the other to pass without stopping. Rarely do we stop, stand aside with a smile, and generously let the other pass. Someone approaches as you're in mid pour. Do you finish pouring, and then set down the pot? Or do you interrupt your cup and offer to pour theirs? If the occupant is looking at the computer, or otherwise unaware of your approach, do you knock on the doorjamb? Clear your throat? Say hello? Or do you ask for directions to the Emerald City? Do you stand? Say hello? Smile? Offer the visitor a seat? What if you've never met? Do you ask, "Am I in the right office?" Someone drops a book, some papers, their badge, etc. Do you do nothing? Do you pick up the items? Do you just point them out? Or do you make a self-effacing remark: "Hey, I thought today it was my turn to drop stuff…"
Would you like to see your comments posted here? rbrenHmuaScQeKTleAqUqner@ChacPrQQBVxSyAPWoDdpoCanyon.comSend me your comments by email, or by Web form. When groups of decision-makers confront complex problems, and they receive opinions from recognized experts, those opinions sometimes conflict with the group's own preferences. What tactics do groups use to reject the opinions of people with relevant expertise? I offer email and telephone coaching at both corporate and individual rates. Contact Rick for details at rbrenmoFpFtzTpUDUMfHwner@ChacsrDgtJWEULkrolspoCanyon.com or (650) 787-6475, or toll-free in the continental US at (866) 378-5470.